Oh I nearly forgot to mention I've managed to find a date for a new one day workshop running on Sunday 1st June. I've been working with Roy and Steve (Candy Box Crafts) on a mini album and drawer combo to decorate in the bright and cheery Mother Goose papers. They've come up with an amazing little double drawer design I'm sure you'll love. It's a work in progress at the mo, but I've added details of the workshop to the blog. Click here for more info and booking details. Pics of the project will be added over the weekend. It's so cute. Morning Clare, We are definitely being spoiled beautifully by you, I will be watching this video later, and will definitely be trying out the bows and the exploding boxes, they are stunning !! Thank you so much for doing this for us. I am off to buy plants and flowers for visits to Crem and graveyard, as soon as shop is open, I'm on a definite 'time schedule' today haha, better go and get dressed !! This is gorgeous, love the papers and a great tutorial too. Thank you for sharing. I don't believe I have ever seen anything you have created that wasn't absolutely gorgeous. I envy (and so admire) your creativity. Beautiful. Thanks for the tutorial. Hi Clare, Loving this, so bright and beautiful. The flowers are gorgeous. Thank you for the tutorial too. 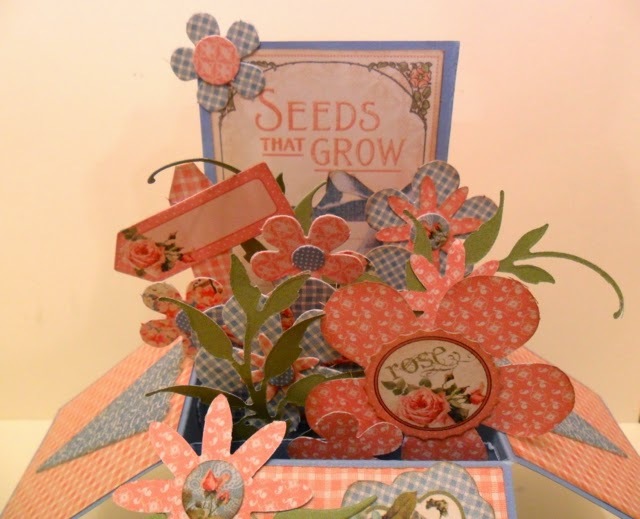 Thanks for sharing the tutorial - so kind - another beautiful pop up box card. Hi Clare, just got home late this afternoon from my 3 day scrapbook retreat!! We call it chocolate since all women love Chocolate, or most of us anyway!!! It was lots of fun, I finished 3 projects and will be posting photos soon. Love the video on the pop up card, will have a go at it tomorrow probably. Thanks so much for all your input and sharing of techniques. Gorgeous card and wonderful video! I am going to make on for myself today! Thank you! Wishing you a happy day!